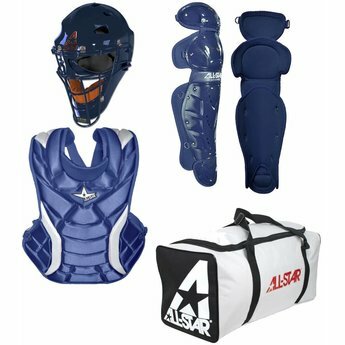 The Fastpitch Series™ Catcher's Set includes a catcher's mask, chest protector, leg guards, and equipment bag. Helmet - MVP2310: The dual density foam liner, ABS plastic shell, and steel cage. Padding is not removable. Meets NOCSAE Standards. Fits sizes 6 1/4 - 7. Chest Protector - CPW13PS: Designed for the intermediate softball catcher, the Women's Player's Series Chest Protectors have the same cut as All-Star's System Seven™ series, but are constructed with a more economy grade of materials. Size: 13". Leg Guards - LGW115FP: These double knee designed leg guards are great for beginners through intermediate softball catchers. Size: 11.5".